A canoe glides. What if that could be incorporated in a stable fly fishing boat with room, comfort and speed - that even a child could lift? In river fishing the finely crafted fly rod is your "instrument"...much like a musician has his or her guitar, violin, or piano. When trout fly fishing on interior western lakes the BOAT is really your "instrument". This instrument is designed to deal with weight, speed, stability, wind, comfort, and ease of use. Cunningham Boats will be in touch with you within 24 hours! The Chironomid is a trimaran with a central canoe hull. The main hull is built by Hellman Canoes in Nelson B.C. from a mold specially designed for this boat. 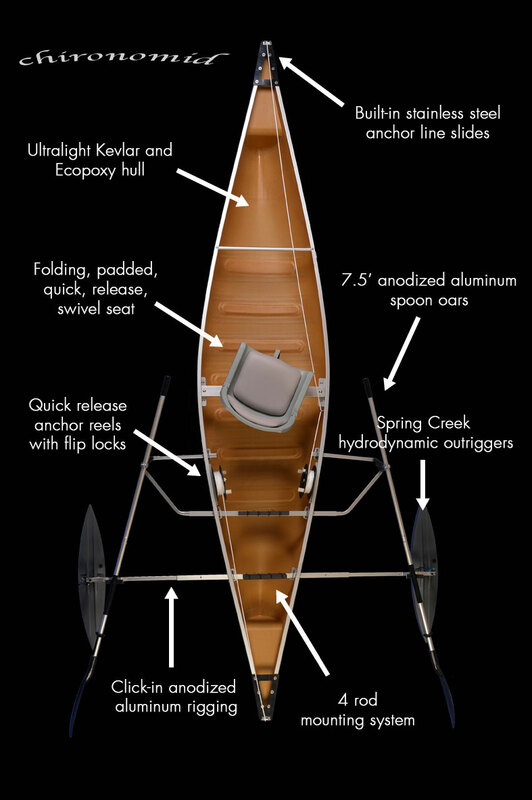 It is made of Kevlar and Ecopoxy - as high quality and tough an ultralight canoe hull as you can find anywhere. Ecopoxy is an environmentally friendly epoxy that is actually superior in strength and UV resistance to traditional epoxy. It is superior to polyester and vinylester resins as well - the resin used in most premium boats of this type. It is a “clear Kevlar” boat. The bare hull weighs a mere 30 lbs. The aluminum rigging and anchor system have been designed by Joe Cunningham in conjunction with Chuck Newberg of Spring Creek Manufacturing in Minnesota. Chuck has been inventing and building unique and highly acclaimed water-sport accessories for many years. Joe is a 40 year fly fishing veteran. 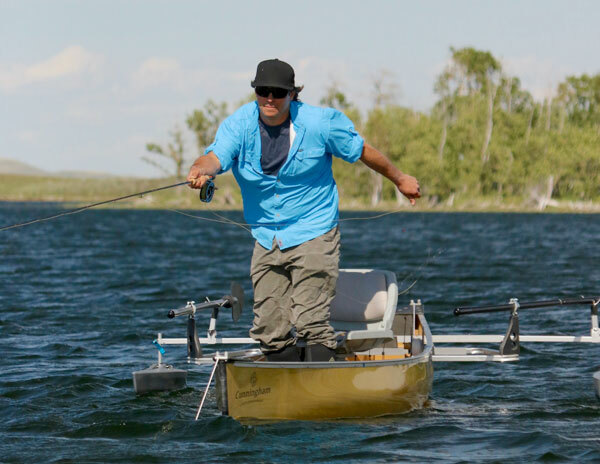 This special boat is designed to be the most stable, comfortable, and effective single person fly fishing stillwater boat that exists while at the same time being fast, comfortable, almost impervious to wind, and extremely easy to deal with out of the water. For boats only, delivery is made by Cunningham Boats. When purchasing please CONTACT US for arrangements and further details. **We sometimes have demo or used boats for sale. To get all that with a more conventional solo boat approach, in a quality built boat as the Chironomid is, you will need an eight to 10 foot aluminum welded Jon boat ($1900 CAD), a good electric motor ($170), a good Group 27 AGM deep cycle battery ($300), a decent battery charger ($130), a boat seat ($60), a swivel seat mount ($20) 2-10 lb. anchors, anchor line, line guides with cleats ($190), 2 rod holders ($80), and the boat itself will weigh around 140 lb. so you'll need a boat lifter ($2000). Now the Chironomid (the part you put on your roof) weighs 40lb. That's incredibly easy to deal with. All you need to transport your boat is any roof rack. In fact, on most roof racks it's easy to carry 2 Chironomids. Roof rack system ($600 to $900). This boat comes with everything else to complete our comparison. So the Chironomid, plus a good roof rack system, adds up to ... $4,200.00 to $4,550.00 CAD. But you also get a boat that doesn't pound on the waves but glides and cuts, you don't need to deal with stuff like batteries, chargers and electronics, the anchor system has reels and is built in, and, frankly, it's the coolest boat on the water! Beauty and intelligent simplicity. This video shows the Cunningham Chironomid being fished from while standing. It also shows Joe pulling up the 2 anchors and then demonstrates the speed of the boat as it leaves for another location. Demonstrating set up of the Cunningham Chironomid - a unique new fly fishing boat specially designed for the trout lakes of western North America. The Chironomid is FULLY GUARANTEED for materials and workmanship for 5 years.